You can tell just from the name that Hawaii Volcanoes National Park is much different from your run of the mill typical national park. Here, it’s all about lava flows, lava rock formations, and lava petroglyphs. 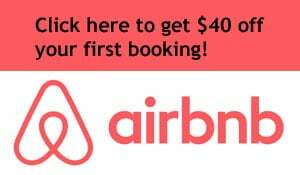 Here’s a preview of the six activities you’re most likely to take part in when you arrive at Hawaii Volcanoes National Park on Hawaii’s Big Island. Best of all, most of these can be accomplished during a single day in the park! 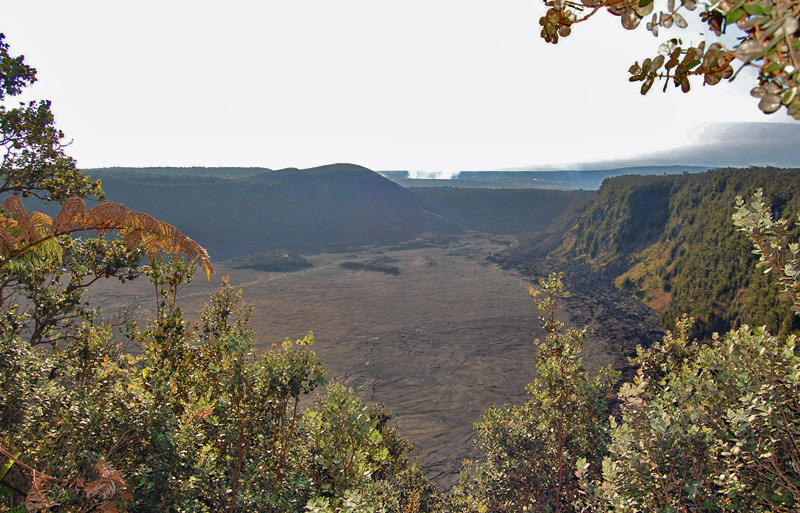 Crater Rim Drive is an 11-mile loop starting at the park entrance near Kilauea Visitor Center. This road includes a number of spots where you can peer into craters and take in the unusual landscapes created by previous lava flows. Stop at any pullout to get your first glimpses of the impressive hills, calderas, and foliage. Parts of Crater Rim Drive are often closed due to volcanic activity, so check in at the visitor center to see exactly how far you can go. 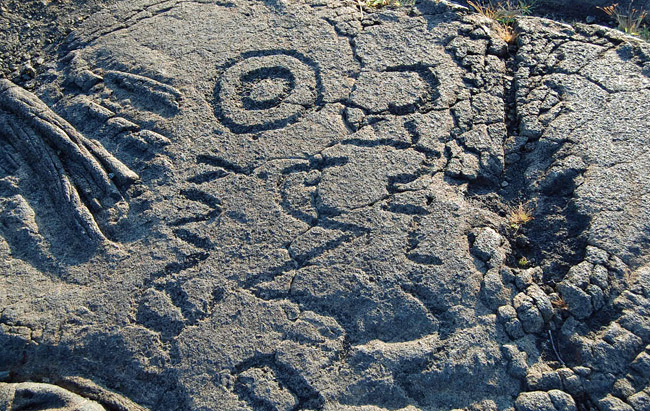 Between the years 1200 and 1450, natives carved roughly 23,000 drawings into the hardened lava at a site known as Pu’u Loa. 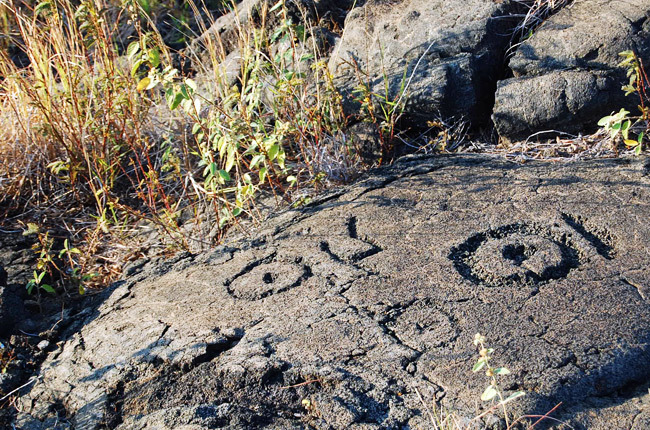 These petroglyph fields are among the most popular areas of the national park. A walking trail three-quarters of a mile from the main road leads to the petroglyphs. You can see all sorts of fascinating designs in the lava. Consider Pu’u Loa a must-see when you visit the park. Kilauea has been continuously erupting since 1983. 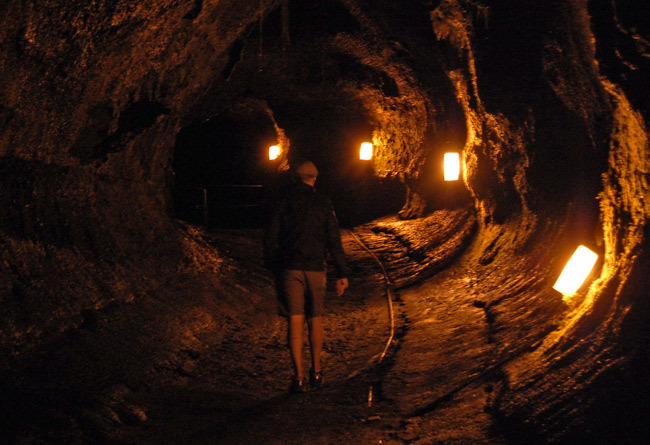 The best way to view the glow of the molten lava is to take an after-dark visit to Jaggar Museum, located along Crater Rim Drive. 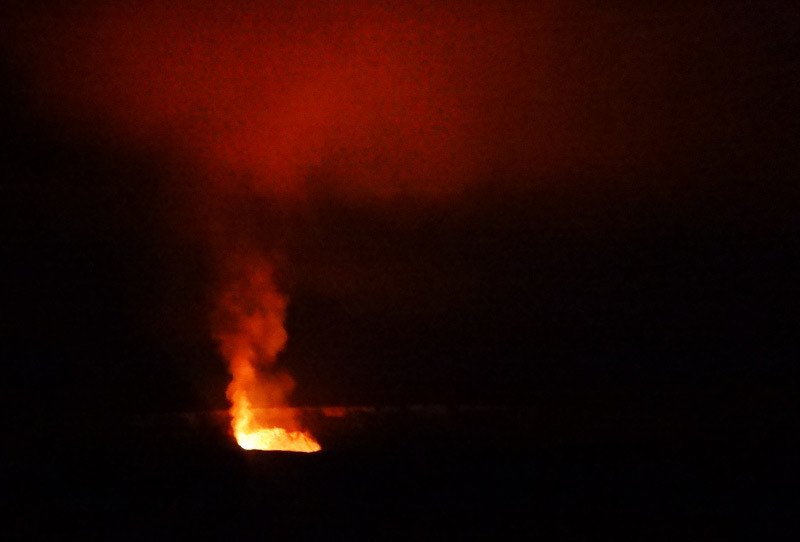 From the popular lookout point there, you’ll easily be able to see the nighttime red-orange glow of Halema’uma’u Crater just one mile away. 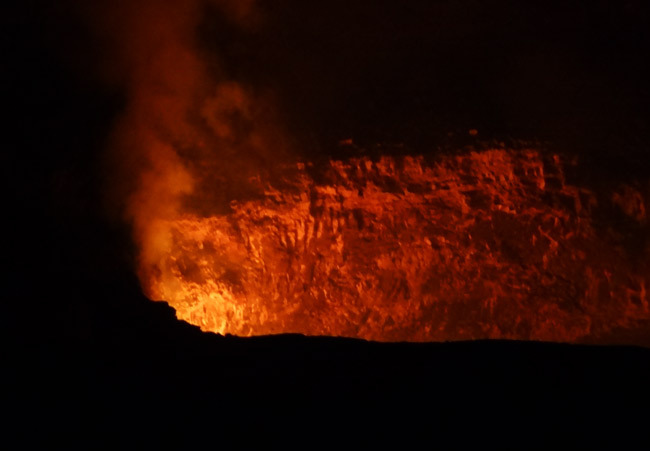 There are very few places in which you can view active volcanoes from this close, so take advantage of the opportunity! 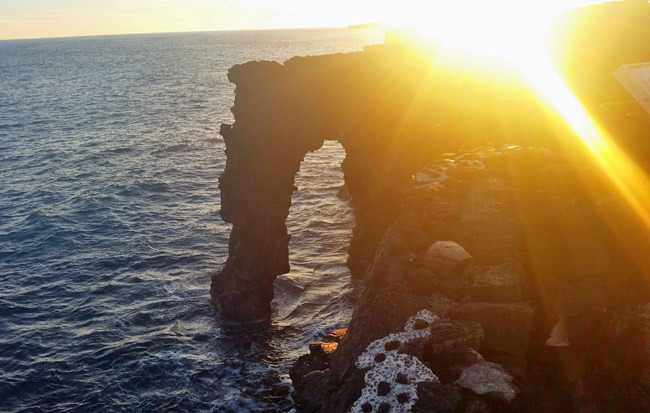 At the very end of Chain of Craters Road is the famous Holei Sea Arch. The lava here arrived during a lava flow 550 years ago, and the arch itself was formed by the water within the last 100 years. The arch is 90 feet high and looks especially impressive at sunset with the sun behind it. You can walk right up to the arch, but beware. The National Park Service has posted signs warning visitors that eventually, the arch is going to crumble into the ocean. You probably don’t want to be standing on top of it when it does. 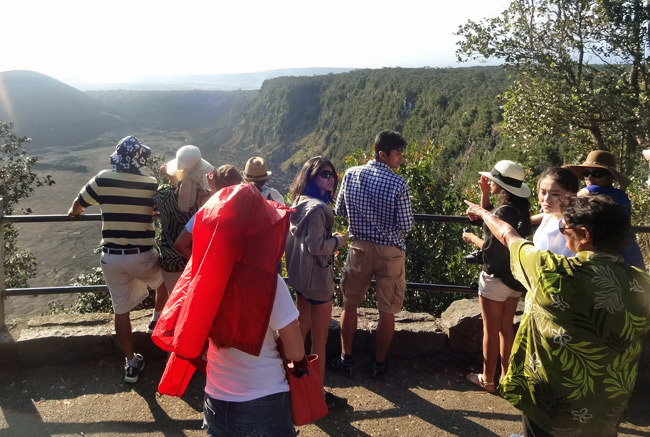 One of the coolest photo opportunities at Hawaii Volcanoes National Park isn’t listed on the park’s brochures or online guides, so listen up! On Chain of Craters Road, a few miles before reaching the petroglyphs, keep an eye open for a side road partially covered by hardened lava. Alanui Kahiko means “old road.” This used to be Highway 130, the main road through the park, but a 1972 eruption buried around 10 miles of the road. Only small portions of it remained uncovered by lava. 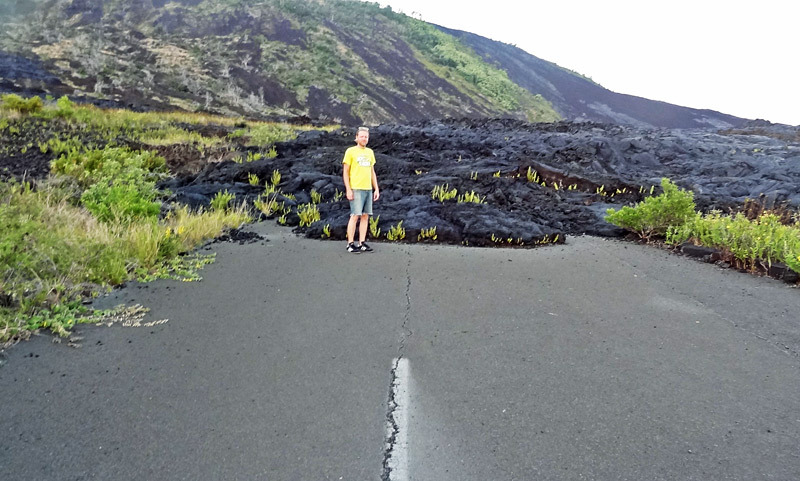 You can walk right up to the spot where the lava cooled on the old highway and get a winning Instagram photo right where the lava flow stopped. 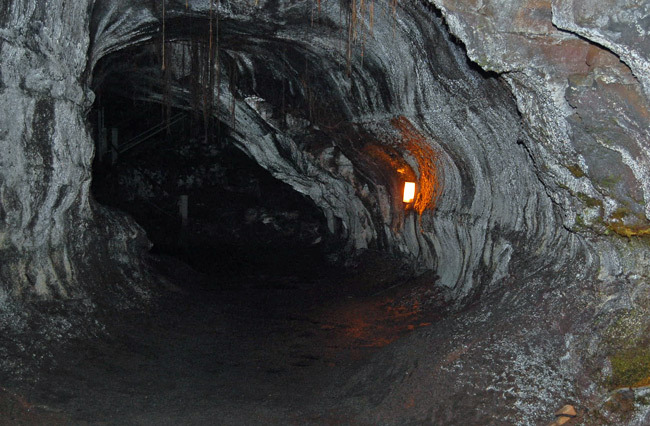 Discovered in 1911, Thurston Lava Tube is a cave-like structure that used to house a lava river hundreds of years ago. Walk from the nearby parking area through a fern forest and into the tube. Give yourself at least 20 minutes. I highly recommend doing the Lava Tube during the day. We did it at night on the way back from Holei Sea Arch, and that was a bad idea. The walk from the car to the tube was pitch black with almost no lights and a path that was difficult to follow. During the day this would not be an issue at all.